A fire in Mission Trails Regional Park scorched about 2 1/2 acres of brush Sunday and closed eastbound state Route 52 between Santo Road and Mast Boulevard for about a half-hour. 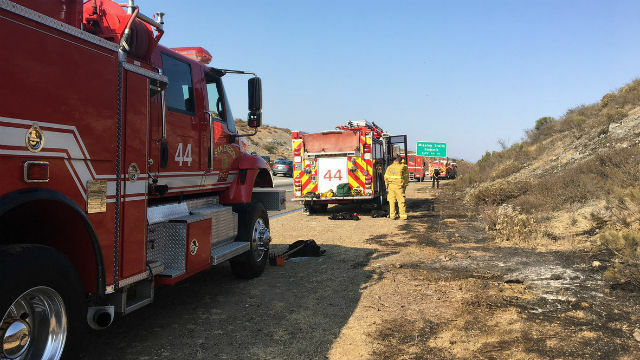 The blaze erupted about 3:15 p.m. on the south side of the highway moving up a hillside toward the Fortuna Trail, San Diego Fire-Rescue Department spokeswoman Monica Munoz said. No structures were threatened, and nobody was on the trail when firefighters arrived in the park to battle the flames. Munoz reported just before 5 p.m. that the fire was contained. Firefighters from the Miramar Air Base, located just across the highway, helped the SDFRD crews, Munoz said. A sheriff’s helicopter also responded, and Cal Fire crews were expected to help with the mop-up phase. The California Highway Patrol closed all eastbound lanes of the highway just before 4 p.m. and traffic was diverted onto Santo Road. One lane was reopened about 4:30 p.m., and by 4:45 only the far right lane was still closed.